Under 14 Girls Intermediate – Heather Goodall – 2nd, along with Beth Clutterbuck-Allen, Elle Greensmith and Amelia Holland the team from Long Eaton School were 1st. 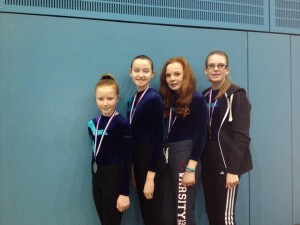 The team from Kirk Hallam School – Evie Barker, Chloe Smith, Amy Allen and Louisa Hobby were 2nd. Under 19 Girls Intermediate – Lani Diggle 2nd, along with Leah Dacres and Kate Williams the team from Long Eaton School was 1st. Katie Jones from Friesland School was 8th. The Zonal round was held in Cambridge on 10 January, the club had excellent results. These will all be going through to the National Schools on 14 March in Birmingham.